The Husseini Islamic Center, 5211 Hester Ave, Sanford, FL 32773, invited Sheikh Farrokh Sekaleshfar to speak at their Mosque. Dr. Sekaleshfar says the killing of homosexuals is the compassionate thing to do. When Sheikh Sekaleshfar calls for the death of all homosexuals based on the tenets of Islam it can not be ignored, he is an expert on Shariah Islamiyya or Islamic Law. Islamic Law also mandates a death sentence for blasphemers and apostates, does Sheikh Sekaleshfar and the Husseini Islamic Center Mosque advocate those legal rulings as well? This tepid response from Rev. Fulwider is problematic because he refuses to denounce the Husseini Islamic Center Mosque for promoting a speaker who calls for the murder of homosexuals. Rev. Fulwider can’t even say that calling for the murder of gays is wrong. Fulwider concludes by adding insult to injury, saying don’t worry about the gays they can take care of themselves. 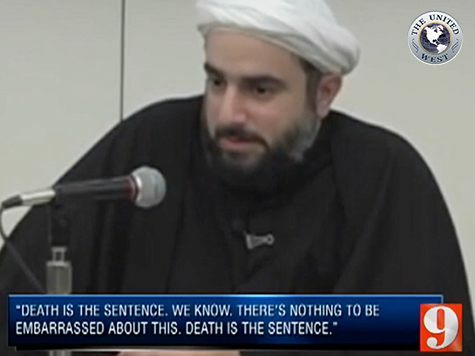 Equally as troubling is the leadership at the Husseini Islamic Center Mosque in Sanford, FL never condemn or disagree with the words spoken by their speaker about the killing of gays – silence is consent. It would appear the hatred of gays by The Westboro Baptist Church has been eclipsed by Sheikh Sekaleshfar and the Husseini Islamic Center Mosque of Sanford, FL. Both of these supposed places of worship should be stripped of their 501c3 status and relegated to the dustbin of history. Be the first to comment on "Orlando Mosque says “USA must be cleansed, starting with gays”"